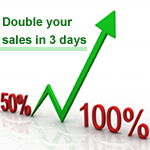 How to double your sales in 3 days - Guaranteed! →How to double your sales in 3 days – Guaranteed! How to double your sales in 3 days – Guaranteed! You are looking for ways to double your sales right? I’ve got something to share with you because it’s evergreen and produces results day and night. Recently I did a crazy thing! I bought a piece of software which I did not need immediately. But I knew it would be useful for me in the near future. This act was against my “rules” to purchase something I don’t currently need. But I went ahead and bought it anyway and I’m sure many others did same. The product seller ran a time-sensitive 50% discount for only 72 hours. When I got to the sales page, there were only 2+ hours left. Since I was about to step out of the office and call it a day, I had to make a decision right then and there because come tomorrow the discount offer won’t be available again. Whenever you run a time-sensitive discount offer, sales spike. Especially on the last day, when sales skyrocket! Because people are afraid they’d miss out on good things, on good offers. They don’t want to lose out. The fear of losing out is greater than the pleasure of attaining something. How to double your sales in 3 days? If you want to quickly explode your sales in a short period of time, run a time-sensitive discount for your product. The bigger the discount, the more sales you’ll make. That’s another perfect way to scratch money from readers’ wallets. In dimesale strategy, the price goes up gradually and steadily after each sale until a certain maximum is reached. That causes people to buy quickly to avoid buying it later at a more expensive price. Some sellers are really smart, I must mention it! Some on the other hand still need to be told what to do. There seems to be an important event everyday. Well, that doesn’t mean you have event based discount code daily. Some events are more popular that others. To be smart, take advantage of such popular events, generate time sensitive discount codes to boost sales. Make sure these coupons are only valid while the event is on. While not do something on your next birth day? Share a gift to your readers and make more simple. This is simple! Just create your birthday discount code and spread it around. One of the reasons you won’t be able to benefit from any of this strategies is your sales platform. Some of the widely known shopping cart platforms we have today don’t have support for time sensitive discount and or dimesale systems. This is lame if you ask me. Some don’t even have the most basic of all promotions facilities – coupon tool. So what do you do if you must join the camp of the successful? Switch to Zaxaa. Yes! that’s the answer. You need a sales platform that’s endowed with flexibility. Besides, you can start selling for free. Checkout my Zaxaa review here. This platform was designed for smart authors and product owners. Do you sale anything online? Do you want to increase sales and double your profit? Go ahead and implement this strategy. You are so right with this again bro. Discounts, dimesale works a lot in doubling or tripling incomes. Better still of you sell digital products/tools required and useful to everyone. You’ll sell more of the product with any additional cost for production. Good to see you here bro and thanks for the comment. BTW howz everything going in Nigeria? Nigeria? We hoping and working out things for the best. Creating a discount coupon is great for increasing the sale and if it is combined with some ad network such as adword then it will definitely bring a whole lot of sale. Hello Enstine, I think I am getting it– A sense of urgency so to say Right? I have never heard about Zaxaa and did go and read over your review, as you have stated this does look like the perfect platform to sell a product..
Yeah – a sense of urgency. It has to be time sensitive to get quick results. If someone find a sale is going on with huge discount then people will purchase like mad. This thing is more common in the developed countries as they have more purchasing power. So in the terms giving a discount on products you are both inviting visitors from US, UK or Canada or some above developed places and also at the same time generating money also. Showing emergency for your product, you can certainly boost your sale. I also like to admit that your product must be valuable. To be frank, I wasn’t aware of “dimesale” technique, but certainly a great way to force your potential customers to buy your product as soon as possible. This information can help many bloggers to increase their affiliate sales and product promotions and can boost their income to good level and thanx for sharing this wonderful aticle. I have bookmarked this article to read later but due to busy in my work i forgotten to read and became late to comment. I am very sorry for that Enstine sir. When i see “Guaranteed” word in your article then it means something awesome information is revealed inside the article. Same thing happened here. This is really a helpful guide for me to double sales in 3 days. I loved the concept you described in “Take advantage of events” section. Thank you so much sir for this nice update. Marketing is the essential thing to boost any product sale and yeah discount often converts well but I liked the concept of events as well. Moreover I think, more you spend more you get. Funny how things turn out… I bought something only a couple of days ago and paid via Zaxaa and thought “What on earth is this – never heard of them” LOL. So now I know. Anyway, I have to say that the transaction went through very smoothly, so from a buyer’s point of view I can recommend it. Now a second comment from you today Joy! Smiling here! I understand this method totally. I don’t blame you for jumping on that deal. I would have probably have done the same thing since I knew I would use it sooner than later. The Dimesale is actually a new one to me. I have not noticed one doing a sale that way. Do you think that a gradual increase in price would not add as much urgency as a increase back to 100%? I prefer an all or none kind of approach! Nice one Enstine! Take care.. I think the gradual move upward creates more urgency. You know if you waste a minute, you’ll pay more so why wait?